Production | Volodarka - магазин классической мужской одежды. 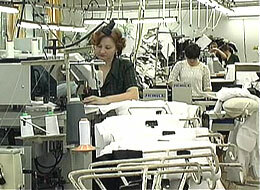 The particular pride and the fixed capital of the garment factory are the high qualified specialists and equipment. XXI century gave its own corrections in the enterprise activity– now the production lines and processes are provided with the last modern technique. Sewing benches “DURKOPP ADLER”, “PFAFF”, “JUKI”. The line of the wet-heat processing of “VEIT KANNEGIESSER”. Applied technologies essentially lighten the work of creating, preparing and sewing the models and also provide the high quality of details cutting. 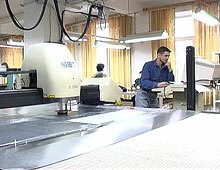 All goods are subjected to the technological processing and the close control of the quality control department. As regards the raw materials selection, the high-quality fabrics from the well-known leading material producers of Italy, Germany, Slovakia, Russia, Lithuania and Ukraine are bought. Due to the modernization last ten years the enterprise managed to increase the output of products twice as much and the total efficiency threefold. Nowadays there are 1000 persons are working in “Volodarka” the result of their work is half a million pieces units of ready-made garments. An individual technological and professional attitude allows to create the clothes of the highest quality level in all production standards – from the cutting to the final wet-heat processing. The collection of the trade mark “Volodarka” consists of 100 self- developed models. You can familiarize with the collection of our goods and the latest news of assortment in our firm sales outlet. For the representatives of the business partners there Online www.volodarka.com is the room of range of goods in the factory.